sir, i have a daughter and married to a man who is not the real father of my daughter. My husband wants to adopt my child. What if we talk to the biological father of my child and he agrees that my husband will adopt the child? do we still have to undergo the long process? thank you for your response sir. I have another question, what if ung apilyido ko na lang po ang gamitin ng anak ko at hindi ung sa biological father nya? pwede ko po bang ipatanggal na lang ung apilyido ng biological father nya dahil hindi rin naman po siya nagsusustento sa bata? Please read my post "What surname should illegitimate children use? Problems and issues with RA 9255 and its implementing guidelines" (look for the link in the sidebar). Read especially the last two or three paragraphs on what can be done about changing the surname from the biological father to yours. Can the mother alone consent to an adoption if the father has abandoned the family? Please consult the social worker assigned to the Family Court of the city where you are residing regarding this matter. In some cases, the petitioner states in the petition that he/she has exerted earnest and diligent efforts lo locate the whereabouts of the other biological parent. Sometimes also, the petitioner claims that the biological father (or mother) abandoned the child from infancy, and there has been no communication since then. Family Court judges differ in their practices with regards adoption proceedings. There are very strict judges who follow the letter of the law. There are judges however who are lenient. That’s why you should consult the social worker of the Family Court where your petition will be filed. (In some places, there is only one Family Court; in big cities, however, there are several Family Courts). 1. You cannot really call yourself an “adoptive parent” until and unless the Family Court’s decision granting the decree of adoption has become final and executory. 2. 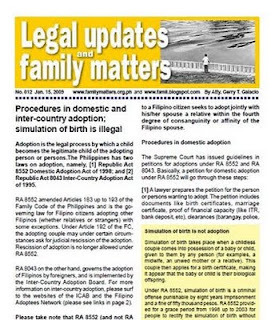 Under RA 8552, the procedure is for the DSWD to have the child judicially declared as “"legally available for adoption". If there had been such a judicial declaration, the biological parent may be prevented from claiming the child later on. atty, im working abroad as well as my husband... he wants to adopt my daughter... hwo can we process the adoption when we are abroad? Under RA 8552, the prospective adopters must undergo interviews with the social worker of the Family Court. Based on these interviews, the social worker prepares his or her recommendations as to whether the court should grant or deny the petition. What you should do is to retain the services of a lawyer. Your lawyer will file the petition with the documents you will provide, and then try to schedule the interviews and hearings during the times that you and your husband would be here in the Philippines Probably during your vacation time). Your lawyer can also resort to what are called “modes of discovery” like depositions to expedite the process. Sir, what is the present rule regarding adoption and succession? Is the relationship created by adoption still personal to the adopter and adoptee? Or did RA8552 made it possible for the adoptee to succeed the parents of his adopter? The books on succession are outdated and the different authors share different views. Do you know of any jurisprudence regarding this matter? The view of Tolentino is still valid: “By adoption, the adopters can make for themselves an heir, but they cannot thus make one for their kindred.” This was also the view taken by the Supreme Court in its Sayson et al vs. CA decision (G.R. Nos. 89224-25 January 23, 1992).As to decisions by the SC after RA 8552 became effective, I am not aware of any that might have changed the rule that adoptees cannot inherit from the family of the adopters.